Driving in wet weather can be hazardous as wet roads can mean reduced visibility and grip on the road. Is your journey essential? can you delay your journey until after the rain / flooding as subsided? If you do have to travel plan your journey in advance and try to avoid areas that are prone to flooding. Check that your windscreen wiper blades are in good condition. If not get them replaced. Adjust your speed and drive for the conditions. Give yourself time to react, slow down if spray is reducing visibility. Leave plenty of room between you and the vehicle in front. It takes at least twice as long to stop on wet roads that it does on dry ones. Slow down if you have to drive through standing water. 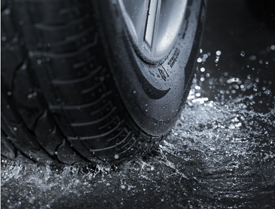 You could lose control of the steering and aquaplane if your tyres lose contact with the road. Avoid driving through floods if you can. Just 15cm of water will reach the bottom of most cars; the depth the water could cause possible loss of control or stall the car. Many cars will start to float in as little as a 30cm of water. Causing you to lose control of the car. 60cm of free flowing water can sweep away most vehicles including large 4x4’s. Drive on the highest section of the road. This is usually the middle. Consider other drivers and properties. Drive slowly so you don’t cause a bow wave. Test your brakes as soon as you can after leaving the water. Never drive through fast-moving water. Your car could easily be swept away. Watch your speed. Roads may have unexpected patches of water that are hidden by a dip or bend in the road. Driving at speed into water that is 15cm deep can feel like driving into a brick wall.